رنگ‌ها از جمله آلاینده‌های اصلی موجود در فاضلاب‌های صنایع نساجی می‌باشند که به‌دلیل ساختار پیچیده مولکولی، غالباً سمی و سرطانزا بوده و در محیط زیست پایدار می‌باشند. بنابراین هدف اصلی این پژوهش بررسی کارایی حذف رنگ بازیک آبی 159 (BB159) از محیط‌های آبی توسط هیدروژل مهره‌های مغناطیسی آلجینات سدیم بود. ابتدا هیدروژل مهره‌های مغناطیسی آلجینات سدیم بر اساس روش راچر و با استفاده از CaCl2 به‌عنوان کراس‌لینک کننده، سنتز شدند. سپس گروه‌های فعال موجود در سطح مهره‌های مغناطیسی تولید شده توسط طیف‌سنجی مادون قرمز تبدیل فوریهمورد مطالعه قرار گرفت. خواص مغناطیسی مهره‌ها توسط مغناطیس‌سنج نمونه ارتعاشیاندازه‌گیری و پارامترهای مغناطیسی محاسبه شد. اثر پارامترهای مختلف از جمله مقدار جاذب،pH ، غلظت اولیه رنگزا و زمان تماس در میزان حذف رنگزای 159BB توسط این جاذب مورد بررسی قرار گرفت. ایزوترم جذب رنگزای 159BB بر روی هیدروژل مهره‌های مغناطیسی آلجینات سدیم توسط مدل‌های لانگمیر، فروندلیچ، تمکین و بی.ای.تی بررسی شد. با توجه به‌ نتایج به‌دست آمده می‌توان دریافت که مهره‌های مغناطیسی آلجینات سدیم دارای گروه‌های -COO و- OH بوده که در جذب رنگزای 159BB با بار مثبت، نقش شایانی دارند. مقدار مغناطش اشباع برای مهره‌های آلجینات سدیم/ نانو ذرات آهن emu/g8/21 به‌دست آمد. 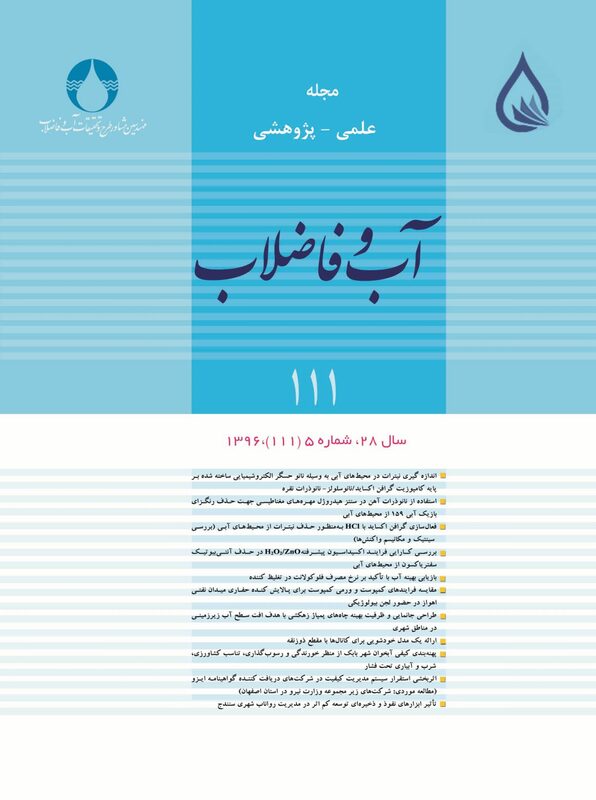 نتایج نشان داد که بیشترین میزان حذف رنگزا از محلول رنگی در pH برابر 11، مدت زمان 120 دقیقه و مقدار 9 گرم جاذب صورت گرفته است. از نتایج به‌دست آمده می‌توان دریافت که حذف رنگزای مذکور از مدل لانگمیر تبعیت می‌کند. نتایج این تحقیق نشان داد که هیدروژل مهره‌های مغناطیسی آلجینات سدیم دارای راندمان قابل قبولی (85 درصد) برای حذف رنگزای 159BB از محیط‌های آبی می‌باشد. Dyes are a main source of pollutants in textile plant effluents. Due to their molecular structure, they are usually toxic, carcinogenous, and persistent in the environment. The aim of the present work was to explore the removal of basic blue159 (BB159) using magnetic sodium alginate hydrogel beads. Magnetic sodium alginate hydrogel beads were initially synthesized accoriodng to Rocher method using CaCl2 as a crosslink agent. Fourier transform infrared spectroscopy (FTIR) was then employed to examine the functional groups on the surface of the magnetic sodium alginate hydrogel beads. In a third stage, the magnetic properties of the beads were measured using a vibrating sample magnetometer (VSM) and the magnetic parameters were calculated. Subsequently, the effects of such parameters as adsorbent dosage, pH, initial concentration of dye, and contact time were evaluated on the BB159 removal efficiency of the adsorbent used. Finally, the Langmuir, Freundlich, Temkin, and B.E.T models were exploited to study the adsorption isotherm of BB159 onto the magnetic sodium alginate hydrogel beads. It was found that the magnetic sodium alginate beads possess both –COO and –OH groups that play important roles in the adsorption of the positively charged BB159 dye. A saturation magnetization equal to 21/8(emu/g) was obtained for the sodium alginate beads/nano Fe3O4. Results also revealed that the highest dye removal from aqueous solutions was achieved at pH=11 in 120 minutes for 9 grams of the adsorbent. The study indicated that BB159 removal using the magnetic sodium alginate hydrogel beads as the adsorbent obeys the Langmuir model. Moreover, it was shown that the efficiency of the process for BB159 removal from aqueous solutions was satisfactory (85%). Ani, I., Ismail, M., Suriani, N., Nursia, H., Effaliza, M. & Audrey Flore, N., 2012, "Synthesis of magnetic alginate beads based on maghemite nanoparticles for Pb(II) removal in aqueous solution", Journal of Industrial and Engineering Chemistry, 18 (6), 1582-1589. Aravindhan, R., Fathima, N. N., & Rao, J. R., 2007, "Equilibrium and thermodynamic studies on the removal of basic black dye using calcium alginate beads", Colloids surf. A: Physicochem, Eng. Aspects, 299 (1-3), ,232-238. Chantrell, R., Popplewell, J., Charles, S., Chantrell, R. & Popplewell, J., 1978, "Measurement of particle size distribution parameters in ferrofluids", IEEE Trans. Magn., 14, 975-977. Gong, J.-L., Wang, X.-Y., Zeng, G.-M., Chen, L., Deng, J.-H. & Zhang, X.-R., 2012, "Copper (II) removal by pectin–iron oxide magnetic nanocomposite adsorbent", Journal of Chemical Engineering, 185,100-107. Karadag, D., Akgul, E., Tok, S., Erturk, F., Kaya, M. A. & Turan, M., 2007, "Basic and reactive dye removal using natural and modified zeolites", Journal of Chem. Eng. Data, 52, 2436-2441. Mok, Y.S., Jo, J. O. & Whitehead, J. C., 2008, "Degradation of an azo dye orange II using a gas phase dielectric barrier discharge reactor submerged in water", Chemical Engineering Journal, 142, 56-64. Monier, M., Ayad, D. M., Wei, Y. & Sarhan, A. A., 2010, "Adsorption of Cu(II), Co(II), and Ni(II) ions by modified magnetic chitosan chelating resin", Journal of Hazardous Materials, 177 (1-3), 962-970. Nageswara Rao, M., Hanumantha Rao, Y., Chakrapani, Ch., Suresh Babu, Ch., Rajeswara Reddy, B. V. & Haritha, P., 2011, "Adsorption studies of methylene blue dye using prepared low-cost activated Kaza’s carbons", Journal of Chem. Pharm. Res., 3(5), 363-375. Navarro, A. E., Chang, E., Chang, P., Yoon, S. Y. & Manrique, A., 2013, "Separation of dyes from aqueous systems by magnetic alginate beads", Chromatography, 8, 31-41. Obeid, L., El kolli, N., Dali, N., Talboot, D., Abramson, S., Welschbilling, M. et al., 2014, "Adsorption of a cationic surfactant by a magsorbent based on magnetic alginate beads", Journal of Colloid and Interface Science, 432, 182-189. Rocher, V., Siaugue, J., Cabuil, V. & Bee, A., 2008, "Removal of organic dyes by magnetic alginate beads", Water Research, 42, 1290-1298. Samarghandi, M.R., Zarrabi, M., Amrane, A., Noori Sepehr, M., Noroozi, M., Namdari, S. et al., 2012, "Kinetic of degradation of two azo dyes from aqueous solutions by zero iron powder: determination of the optimal conditions", Desalin Water Treat, 49 (3) 137-143. Samarghandi, M.R., Zarrabi, M., Noori Sepehr, M., Amrane, A., Safari, G.H. & Bashiri, S., 2012, "Application of acidic treated pumice as an adsorbent for the removal of azo dye from aqueous solutions: Kinetic, equilibrium and thermodynamic studies", Iran Journal of Environ. Health Sci. Eng., 9 (4), 1-9. Santos, S. C. R. & Boaventura, R. A. R., 2008, "Adsorption modelling of textile dyes by sepiolite", Appl. Clay. Sci., 42, 137-145. Shokouhi, R., Hosseinzadeh, E., Zare, M., Torabi, E. & Rahimi, Sh., 2011, "Sodium alginate magnetic beads for removal of acid cyanine 5R from aqueous solution", Hormozgan Medical Journal, 16 (2), 101-111. Zhou, L., Wang, Y., Liu, Z. & Huang, Q., 2009, "Characteristics of equilibrium, kinetics studies for adsorption of Hg(II), Cu(II), and Ni(II) ions by thiourea–modified magnetic chitosan microspheres", Journal of Hazardous Materials, 161(2-3), 995-1002. Zhu, H. Y., Fu, Y. Q., Jiang, R., Yao, J., Xiao, L. & Zeng, G. M., 2012, "Novel magnetic chitosan/poly (vinyl alcohol) hydrogel beads: Preparation, characterization and application for adsorption of dye from aqueous solution", Bioresour. Technol., 105, 24-30. Zhu, H. Y., Fu,Y. Q., Jiang, R., Jiang, J. H., Xiao, L., Zeng, G. M., Zhao, S. L., & Wang, Y., 2011, "Adsorption removal of congo red onto magnetic cellulose/Fe3O4/activated carbon composite: Equilibrium, kinetic and thermodynamic studies", Journal of Chemical Enginering, 173(2), 494-502. Zhu, H., Fu, Y., Jiang, R., Yao, J., Xiao, L. & Zeng, G., 2014, "Optimization of copper (II) adsorption onto novel magnetic calcium alginate/maghemite hydrogel beads using response surface methodology", Industrial and Engineering Chemistry Research, 53(10), 4059-4066.